Asbestos is the term for a group of materials of microscopic fibres and minerals. Asbestos was once a very popular material for many businesses in the construction and building industries due to its appealing properties, but it was eventually discovered to be toxic and dangerous. As the leading asbestos removal company in Kent and South London, All About Asbestos is dedicated to providing customers with safe and efficient solutions to asbestos. Although based in Broadstairs, we service the entire Kent area and many areas of South London, and further. No matter where you are, we can provide a solution to your asbestos issues. If you are searching for ‘Asbestos Removal Bromley’ then look no further. Call All About Asbestos today on 01843 600765 to speak to one of our experienced team! Asbestos has been known as a dangerous material for many years – it has even been banned in the UK since 1999. For any homes that were built before the year 2000, a lot of the materials that were used to build properties during that time used asbestos as it provided a flexible and soft addition to a lot of tougher building materials, such as cement. The dangers of asbestos only become a danger if the asbestos fibres are released into the air and inhaled by another person. Asbestos has been proven to have caused several different illnesses in humans, some of them being fatal. The most common diseases that asbestos is linked to include mesothelioma, asbestosis and lung cancer. It is specifically common in workers that have worked in industrial areas, shipyard workers, builders, plumbers and other similar industries. It can also be found in houses and domestic buildings. In domestic housing, asbestos was used within piping, ceilings, cement and much more, therefore it could pose a risk within a domestic setting. If asbestos becomes crumbled or is disturbed, it can potentially cause problems. Friable asbestos is easily crumbled and therefore can be very dangerous if those fibres were to be consumed or inhaled by someone. Asbestos should be dealt with as soon as possible in order to prevent any health issues or fatalities. If you suspect that there is asbestos in your property or building, you must let an asbestos specialist know. Get in contact with All About Asbestos and we will sort everything out for you. Don’t ever take the risk when it comes to asbestos. Always consult an expert when you have concerns as they will be able to provide help and guidance. Catching the asbestos as soon as possible will reduce the risk of you being affected by the fibres – All About Asbestos will always put your safety above everything else when it comes to any asbestos concerns. Asbestos can be put into 2 main categories, friable and non-friable. Friable asbestos can usually be identified when the asbestos appears crumbled and not solid. 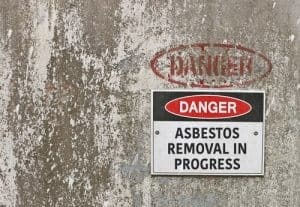 Asbestos can sometimes become friable if it has been damaged through demolition or construction, therefore it’s extremely important to be aware of your surroundings when you are dealing with asbestos. Crumbled asbestos can easily be inhaled so be sure to stay away from the affected area until a professional has looked into it. Non-friable asbestos is more solid and is not easily disturbed. You won’t always need to remove non-friable asbestos due to the potential dangers. An asbestos expert will be able to advise on whether the asbestos needs to be removed. At All About Asbestos, we have dealt with all different types of asbestos and therefore know exactly how to identify and remove dangerous asbestos-containing materials. If you unsure as to whether the asbestos is friable or non-friable then we would highly recommend that you contact us. We will be able to come out to your building and provide you with a full survey for the asbestos which will determine whether we need to remove it. Continue reading the article to find out more about the survey itself! Get an Asbestos Survey First! Before you decide to book any kind of asbestos removal, ensure the asbestos has been properly identified and analysed. This comes in the form of an asbestos survey where we will use our tools to pick out the asbestos and the areas of the building that have been affected. This is extremely important as it will allow us to section off dangerous areas of the building and also accurately identify the asbestos. Many asbestos samples get sent off to a laboratory in order to confirm the asbestos-containing materials. Once asbestos has been confirmed, the team will then consider the options you have. Depending on the condition of the asbestos, it might not have to be removed. This will depend on several different factors such as friability, age and the place in which it was found. If the asbestos is deemed to be removed, you’ll just need to book in a removal date with the team. We aim to get this booked in as soon as possible for customers due to the health concerns that come along with asbestos. We always provide our customers with the correct advice and never charge you for work that doesn’t need to be done – your safety is our top priority. Before you have any asbestos removed, you’ll need to have had an asbestos survey carried out at your property. This will enable us to identify the asbestos that is present and also allow us to work out the best plan of action for the future. In some instances, it may be safer to leave the asbestos and alternatively, sometimes there is no other option but to remove the fibres. It is hugely important that asbestos is managed correctly. We have many years of experience in the industry and therefore know exactly what to do if a customer comes to us with a problem. Our knowledge and experience when it comes to asbestos are vital in ensuring that the issue is dealt with appropriately and with safety as a priority. All About Asbestos, based in Broadstairs, is the leading asbestos removal company in Kent. When you need a reliable and trusted company to take care of the job, look no further. We have many years of experience in the industry as a business and therefore are confident that you will always be satisfied with the job we do. 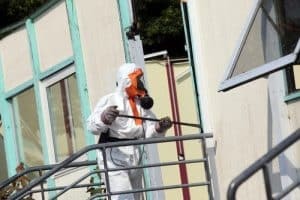 When you choose All About Asbestos for your asbestos removal, the removal will be taken care of by industry experts who will ensure all safety precautions and HSE regulations and followed during the process. We have undertaken jobs all over Kent and South London and even further across the UK. Whether you need an asbestos removal in Bromley or Broadstairs, we can provide our services to you. For more information on our Asbestos Removal Bromley Service, please give us a call on 01843 600765. One of our team will be able to answer any questions or queries you may have.